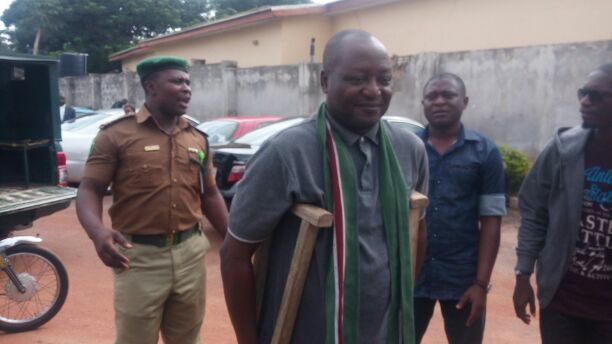 Kaduna State High Court 10 sitting in Kaduna on Thursday asked that former Kaduna Correspondent of Vanguard newspapers, Luka Binniyat be remanded in Kaduna Convinct prison pending the time his bail conditions will be reviewed by the court. The Kaduna born journalist, Binniyat is being tried in court over a report he wrote about crisis in Southern Kaduna which turned out not to be true which was published in Vanguard Newspapers earlier this year. Binniyat was sent back to court by presiding Judge, Justice Bashir Sukola after spending 52 days in prison due to his inability to meet his bail requrement. If all things equal, he will be spending another 40 days in prison before his bail condition will be reviewed by the court. The case was adjourned to October 9, 2017 as a result of an appeal for adjournment filed by the prosecuting counsel led by Kaduna State Director of Public Prosecution, Bayero Dari. Dari had filed an instant application for adjournment citing the change of prosecuting counsel, with the defence counsel, Barrister James Kanyip opposed, but could not get the mercy of his Lord. Speaking to newsmen outside the court, Director of Public Prosecution, Dari, said that the adjournment was not deliberate. He explained that the instant adjournment was necessary because the case had been transfered to a Senior Advocate of Nigeria (SAN), who has been debriefed and needed time to go through the case file. Lead counsel to the accused, Barrister Kanyip said he was disappointed that the bail condition review was not done at Thursday’s sitting. He argued that the motion for review of the bail condition was filed since August 7 and the prosecuting team had ample time to study it. “I am okay with the adjournment of the hearing of the case, but disappointed that review of the bail was not entertained,” he said. When asked what would be his next line of action if his motion is not treated satisfactorily, he vowed to further seek redress at the court of appeal. The court was filled with scores of Luka’s wife, colleagues in the media profession and several top Southern Kaduna elite.